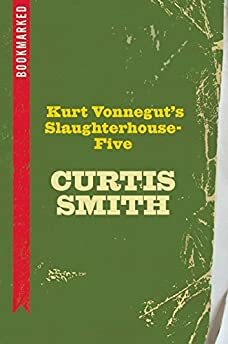 Largehearted Boy: Book Notes - Curtis Smith "Kurt Vonnegut's Slaughterhouse-Five: Bookmarked"
Curtis Smith's Kurt Vonnegut's Slaughterhouse-Five: Bookmarked s the first book in Ig Publishing exciting new series where authors explain how a book influenced their writing. Writing a book about a favorite book is kind of like a nerdy, dream-within-a-dream. When I was approached about the project, I immediately considered Slaughterhouse-Five. A favorite book from one of my favorite authors—and as such, there was a moment of trepidation at the project's start. Who was I to tackle this man's work? Then I started my initial note jotting, and by the time I'd finished a page, I found myself down the rabbit hole. Slaughterhouse's tone is light and comic, yet so much roils beneath. How can a book with so much death be so funny? It's a balancing act. A magician's trick. A walk through the clouds. Page by page, I filled my notebook. I followed a myriad of threads—the history of PTSD, theories of time, the cataloguing of massacres, historical quotes, Vonnegut's writings and interviews, the quantum noodlings of alternate realities—and I attempted to take these strands and weave in bits of my own experiences. I did my best to remain true to both the book's form and tone. I hope I did it justice. And I hope my music list does the same. Tralfamador is a long way off. Really long. Space Truckin is the only way to get there. Why, you ask, would life forms as advanced as the Tralfamadorians do all that Space Truckin to visit a planet whose inhabitants expend their greatest energies trying to kill their own kind, a planet whose most intelligent beings are caught up in endless cycles of repeating their most horrific mistakes? Here's what the Tralfamadorians would say: "Why is a very Earthling question to ask. Why you? Why us? Why anything?" "Of course," say the Tralfamadorians, "although we don't believe in your God. But, yes, what is is what is, forever and ever. Amen. There are no mistakes because there is no free will. Why is this so difficult for Earthlings to comprehend?" Poor Billy Pilgrim, lost behind enemy lines, hallucinating, his boots full of snow, a prisoner of the Reich. Poor people of Dresden, the Russians closing in, the planes overhead. Billy would meet them in the end, their shelter no match for the science of war. Billy the miner of corpses. The only difference between him and them the shelter of Slaughterhouse-Five. Bowie's gone, and with him, part of my youth. But he's not really gone, is he? In certain theories of time, he still exists, waiting to be reborn in a familiar chord, a triggered memory. Ziggy Stardust on the turntable, the mid-seventies, Vonnegut on my nightstand. That man-boy who is my seed and echo but also a stranger. The man-boy who exists, just as I do today. He waits for me in my dreams. He runs ahead of me, a pace I can no longer keep. Me and Billy Pilgrim, lost within the days of our lives. Sometimes happy. Sometimes not. Always grateful. 1969 and the dream was ending. The previous year's blood, single-shot assassinations, entire villages set aflame. The year's final months—Altamont and Manson. A man on the moon. 1970 or 71—my brother buys Sabbath's first album, and "War Pigs" brims with the mud of the trenches and the stink of death. The shells overhead, manmade thunder, a rain of steel. The hippies with their cries for peace. How self-important, how naïve—their schemes of levitating the Pentagon, of stopping the war. They might as well have tried to stop a glacier. The Tralfamadorians told Billy to only look at the pretty things. "Yes," they say, "it's a beautiful world." The rest of us are only too happy to wear their blinders, to see today's wars as a child might. A blip on the screen, a plume of smoke. The perspective of angels and pilots and orbiting satellites. The suffering below snuffed by our desire to only witness life's pretty things. The wheel turns. Soldiers die. Cities are conquered, the fate of civilians relegated to the collateral. The victors write history, their rapes and massacres hushed. Listen to Voltaire: "It is forbidden to kill. Therefore, all murders are punished, unless they kill in large numbers and to the sound of trumpets." We are surrounded by ghosts—at least in the quantum world. The decisions made and unmade. The trains we miss. The paths unexplored. The hands we fail to reach out and hold. These moments and their domino-tumbling outcomes exist—right now, alongside us—a hundred million echoes, and who's to say the quantum scientists are wrong? Not me, I say. Not us, say my legion of ghost-brothers. Billy Pilgrim first becomes unstuck in time behind German lines. He's a soldier without a gun, a child in a children's crusade, starving and cold. He travels back to the womb, warmth and red light. He wants to return home. He wants to be safe and protected and surrounded by those he loves. Later, after his wife's death and the distancing of his children, Billy finds himself home, crying behind his locked door as a cripple tries to sell him magazines. Home, he learns, especially for a man who's seen such terrible things, isn't always a matter of geography. I don't want to look at pretty things all the time. Most of the time, yes, just not all the time. I need to see the stacks of bodies Billy piled—thirty, forty, fifty at a time. Grandparents, mothers, children. I need to see the torch upon the pyre, need to smell the burnt flesh, if only for a single, horrible second. I don't want to live with Billy's placid acceptance. I want to be angry at all we've failed to learn. I want to understand the fire, if such a thing is possible. There is the A-theory of time. The B-theory. Einstein's theories, the warp found beyond the speed of light. Presentism and Eternalism. Nietzsche's eternal recurrence. Poor Billy, a delicate creature unstuck in time. Poor us, chained to our pinhole perspective as the hours and years fly past. Hello! Farewell! Hello! Farewell! Nothing's going to change Billy's world. "Of course," the Tralfamadorians say, "because nothing can change. Everything is. Everything was. Every always will be. Just ignore the horrible scenes and dead bodies. Just enjoy the pretty things." Jai Guru Deva. Om. Billy, like millions before him, survives the battlefield only to carry his scars through life. Wounds impossible to bandage or stitch. Wounds treated with silence and alcohol and self-imposed exile. Or, in Billy's case, time travel. Billy and the lovely Montana Wildhack in their domed cage. A Tralfamadorian zoo. The nearest human thousands of light years away. Billy Pilgrim, modest and unthreatening on Earth, the prisoner of war forced to wear silver boots and a woman's frock, is now a lord of space. All hail Billy Pilgrim.